My bump is slowly showing at 16 weeks! Some people say that my bump is still small, some say its relatively big for its size. Well regardless of the size, we are still very much excited that we have a big, growing and healthy baby! Anyways, I've been addicted to flats since I got pregnant and sneakers include them! I was never the type to wear flats before but hey, some things are bound to change. Paolo and I were surprised when we were strolling at Boracay almost a month back, we saw that the Fila store was at 70% off. 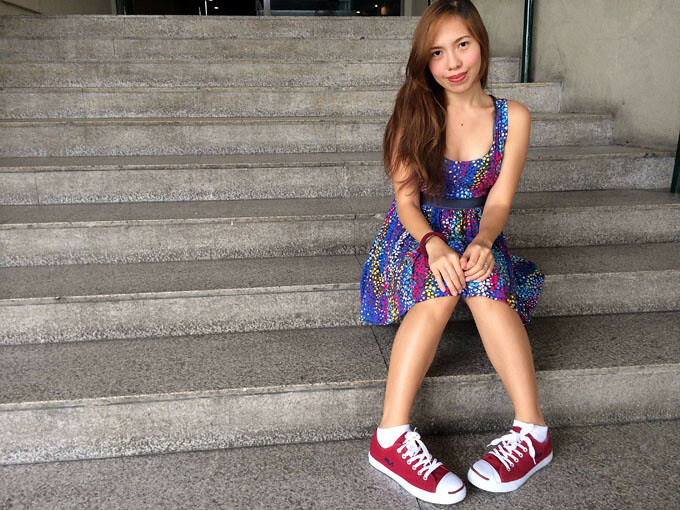 Whats more surprising is we got the red sneakers for only P399! That's a bargain right? Anyways, I hope you guys liked my lakas makabata post! I missed posting here and keeping you guys updated! Hi! Saw your post on World Fashion Blogger group and I'm sure you are a Pinay too.. :) So I just want to drop by to check your blog and to follow you.. :) Anyway, I love your Fila shoes plus the dress is so maganda.. and congrats to your baby.. LOve lots! xoxo! If you are just interested, check out my blog.. I'm still a newbie.. Ihihi! That is so affordable.. I love Fila Shoes too so affordable.. I like your whole outfit, sis! And a huge plus because you look so blooming :) Congrats! So blooming mo ever babe!! :) I really love your looks <3 <3 <3 :) the best fashionista preggy ever!